Out at 7:15AM our first task was to get fuel. First time since Bradenton and we added 100 gallons to fill the tanks - full. We cruised north to Fernandina Beach on Amelia Island. Except for about 10 miles the channel is wide and marshes extend for miles. At the St John's River there is a huge dry dock that contained a destroyer. We managed to get dock space at Fernandina Beach Municipal and avoided anchoring out. 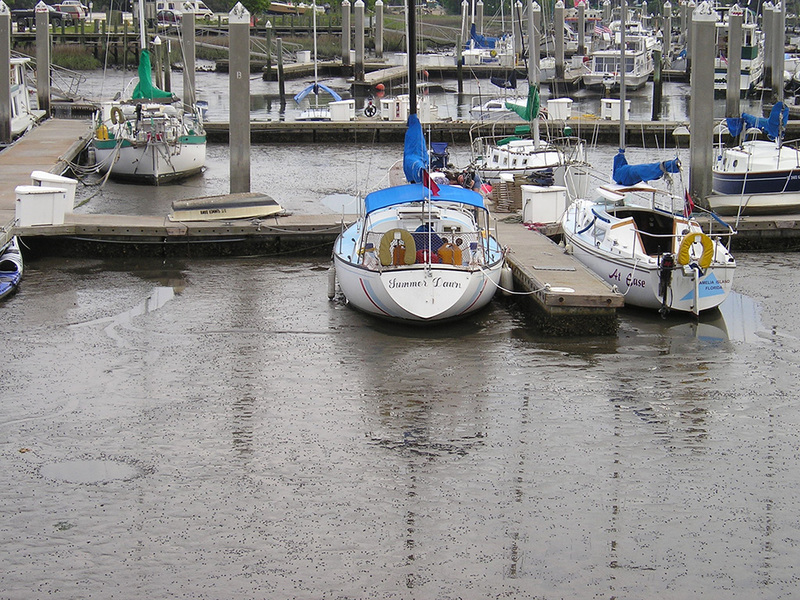 The tide here is 7 feet high and in some slips the boats just settle into the mud. This town was also settled at the same time as St Augustine. It is very touristy as well but much more sophisticated shops than St. Augustine. There are two paper mills here (but no smell so far) and it is a shrimp fishing center. The photo shows the view off the stern of our boat during cocktail hour.